1. Preheat the oven to 200°C, gas mark 6. Line 2 baking trays with baking parchment. On a lightly floured surface, roll out one of the puff pastry packs to about 24 x 24cm. Using either a pastry cutter or a bowl measuring 10cm in diameter as a template, cut out 4 discs. Place 2 pastry discs on each tray. 2. Repeat with the remaining pastry but making the discs slightly bigger than the first ones — about 12cm in diameter. Set aside in the fridge. 3. Place the crème fraîche in a bowl, add the garlic, lemon thyme and some seasoning and mix well. 4. Spoon a teaspoon of the mixture into the centre of the discs on the baking trays, then arrange a few slices of butternut squash and potato on top. Sprinkle with a little Gruyère and then repeat the layers again, starting with another teaspoon of the crème fraîche mixture. 5. 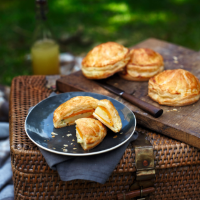 Brush the edges of each filled pastry disc with a little egg and then carefully place a larger disc of pastry over the top of the filling, pressing down well. Pinch the pastry together to seal. Using the blunt side of a small knife, make semi-circular lines on the top of each pie, running from the centre to the edge, making sure you just score the pastry without cutting through it. Brush with beaten egg and place in the fridge to chill for at least 10 minutes. 6. Place the trays in the oven and bake for 25–30 minutes until golden, cooked on the top and bottom and the vegetables are tender when pierced with a knife. Leave to stand for about 5 minutes before serving. Freeze any leftover pastry trimmings to use another time, or make tasty cheese straws. Knead together the trimmings, some finely grated Gruyère and a few poppy seeds. Roll out thinly, cut into 1cm-wide strips, twist 3–4 times then bake for 10–12 minutes at 200°C, gas mark 6 until puffed and golden.